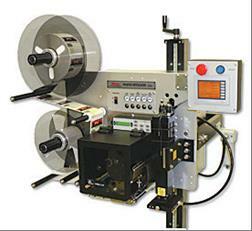 Label Print and apply systems are used to identify products in increasingly automated environments. The system can be easily integrated onto any production line. Windak uses complete solution of automatic label printers with applicators, that can rapidly apply pre-printed or print and apply labels for spools, coils and boxes. Each model is uniquely designed to address specific labeling requirements. Our standard integrations include label applicators from Weber, Markem Imaje and Avery.